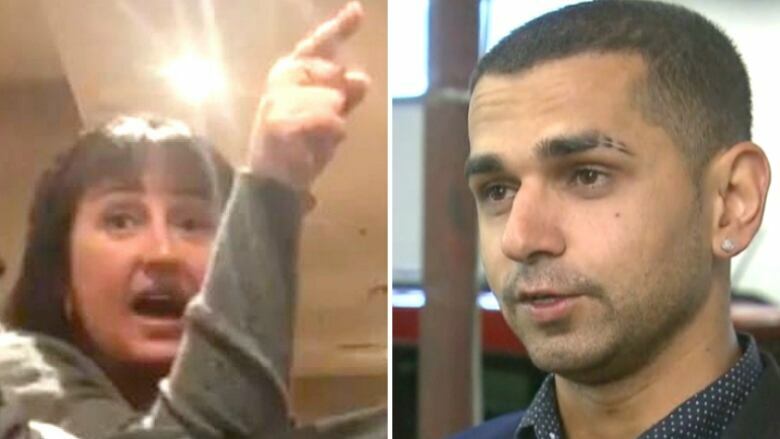 One of the men subjected to a racist rant in a southern Alberta restaurant last month says Canadians have overwhelmed him with kindness after a video of the incident went viral this week. "It's beautiful support; it's amazing," Monir Omerzai told CBC News. "It's amazing how there are so many good people out there. I am just thankful I am in Canada. There are still good people out there, and I believe in that, big time," the Canadian citizen said. The 26-year-old now lives in Lethbridge after immigrating from Afghanistan through Tajikistan 13 years ago. "We should always be good to each other. We just have to respect each other." Omerzai and some friends were at a Denny's restaurant in Lethbridge on April 21 when a woman began swearing at them, telling them to go back to their countries and threatening violence. A video of the encounter was posted online this week, drawing mostly outrage and racking up hundreds of thousands of views. In an interview with Lethbridge News Now, the woman — who identifies herself as Kelly Pocha from Cranbrook, B.C. — admits her comments were racist but says she was provoked and that her actions aren't indicative of who she really is. "If I could take it back, I would. But I can't," she said, adding she wanted to apologize to the group. She admits she had been drinking that night and the argument commenced when the men "started talking in their own language" and began laughing, which she thought was directed at her. Omerzai denies that his friends instigated the conflict. "It's a free country. Everyone can speak their own language," said Omerzai. He claims his friends, all of whom are originally from Afghanistan, were talking about a competitive night of playing video games and joking about who would get the bill when the confrontation began. "Obviously we were not saying anything about her, because she wasn't even facing us," he said. The two sides were seated in adjoining booths. Pocha stood up several times, threatening to strike the men. Lethbridge police Chief Rob Davis said the case is currently under investigation and that police have already spoken to, or plan to speak with, all of the parties involved. 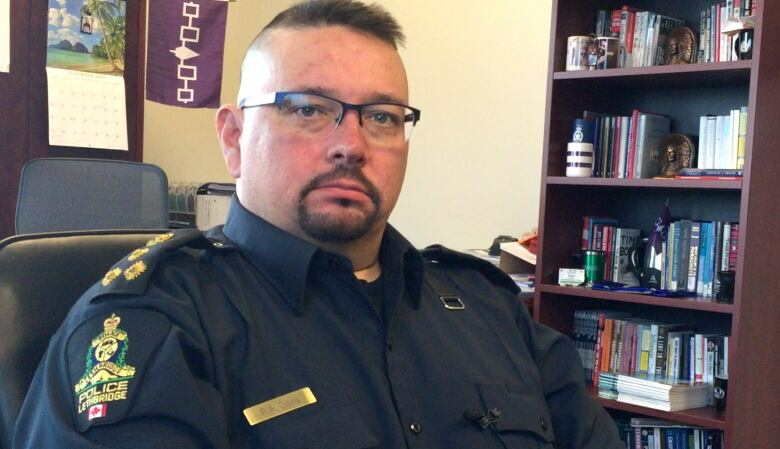 Davis said as an Indigenous man, he's faced what he described as similarly ignorant accusations. "When I heard that it struck close to home for me as well," he said. Davis said while it's possible hate crime charges could be still be laid, it's unlikely as the threshold for charges requires the attorney general's approval. The chief also lauded a bystander heard off camera standing up against Pocha in the video. "If we as a society stand up for one other and stand up for what's right in this country, I think that's a step in the right direction," he said. Pocha's employer announced it had fired her on Wednesday, and Denny's issued a statement apologizing for the woman's behaviour, but stating the manager followed protocol. "She should not judge people by their colour," Omerzai said. "She should have more friends from different cultures. Get to know them, talk to them, sit down with them. You should get to know people before you judge them." An Edmonton-based anti-racism advocate said that people of colour experience this sort of racism more often than many would think. "This is what the reality is. People act this way," Jesse Lipscombe told Alberta@Noon on Thursday. Lipscombe experienced a similar incident in 2016 when a motorist hurled racist slurs at him, prompting Lipscombe to co-found the #MakeItAwkward campaign. He said he likes the education approach taken by the coffee chain Starbucks to educate staff after an ugly incident in one of its stores. Two black men were arrested at a Philadelphia location for trespassing after a staff member called police last month. "Starbucks did go ahead with some training which I thought was a great move, to try and be more proactive. Is this just a one-off or is it possible maybe the culture here needs a little bit of help?" Lipscombe said. The CEO at the Centre for Newcomers said the video of the confrontation is disturbing. "I felt like I had been hit in the gut," Anila Lee Yuen said. "What stood out for me, was the fact that it was this open, public space." But she said she's not certain firing the person involved is always the best option if changing behaviour is the goal. "I'd like to see people having conversations, in a less public kind of a sphere, where people can talk about the impact that that really had, where it's not necessarily blaming as much as it is dialoguing, to be able to come to a joint understanding." Omerzai, meanwhile, said the incident has reaffirmed his faith in his fellow Canadians. "Why is there so much hate in her? Why is she saying so many things? Something doesn't feel right. We are all immigrants here," said Omerzai. "Canada has been supportive of immigrants from all over the place. I think we should be proud of the way the Canadian government has been treating us and giving us all the opportunities. I am privileged to live in Canada."